Marvel Announces Premiere Dates for Avengers Assemble and Hulk and the Agents of S.M.A.S.H. Announced at New York Comic-Con last fall, Marvel Studios is set to premiere two brand new Disney XD animated series this summer. Today, official release dates have been announced for both, revealing that fans will see “Marvel’s Avengers Assemble” on July 7 and “Hulk and the Agents of S.M.A.S.H.” on August 11. 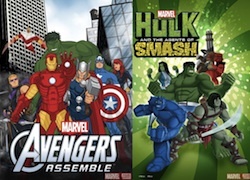 An animated series parallel to the record-breaking blockbuster movie Marvel’s The Avengers, “Avengers Assemble” sees Iron Man leading the team of mightiest heroes – Hulk, Captain America, Thor, Hawkeye, Black Widow and newcomer Falcon – who combine their powers to battle threats no single hero could overcome. When the Avengers assemble, evil doesn’t stand a chance. The voice cast includes: Adrian Pasdar (“Heroes”) as Iron Man, Fred Tatasciore (“Kung Fu Panda: Legends of Awesomeness”) reprising his role as Hulk, Roger Craig Smith (Wreck-It Ralph) as Captain America, Travis Willingham (“Shelf Life”) as Thor, Troy Baker (“Ultimate Spider-Man”) as Hawkeye, Laura Bailey (“The Super Hero Squad Show”) as Black Widow and Bumper Robinson (“The Game”) as Falcon. Joe Casey, Joe Kelly, Duncan Rouleau and Steven T. Seagle of Man of Action Studios (“Ben 10,” “Generator Rex”) will serve as executive producers. “Hulk and the Agents of S.M.A.S.H.” stars Marvel’s biggest, hardest-hitting super hero, Hulk, as he is joined by his larger-than-life teammates and unconventional family – his cousin She-Hulk, the irascible Red Hulk, the exuberant A-Bomb and the savage Skaar – to tackle threats that are too enormous for other heroes to handle. The creative talents of Emmy Award-winning Paul Dini (“Batman: The Animated Series,” “Lost”) and Henry Gilroy (“Star Wars: The Clone Wars”) have been tapped for this series. The voice cast includes: Fred Tatasciore (“Kung Fu Panda: Legends of Awesomeness”) as Hulk, Clancy Brown (“SpongeBob SquarePants”) as Red Hulk, Eliza Dushku (“Dollhouse”) as She-Hulk, Ben Diskin (“Codename: Kids Next Door”) as Skaar and Emmy Award-winning Seth Green (“Robot Chicken”) as A-Bomb.